Kamikaze Collection is a revolutionary range of high-end boutique car care products designed and manufactured in Japan, home of ceramic coatings. Combining state-of-the-art technology with traditional know-how, Kamikaze Collection prides itself on delivering truly innovative and unique products without the typically associated hype. 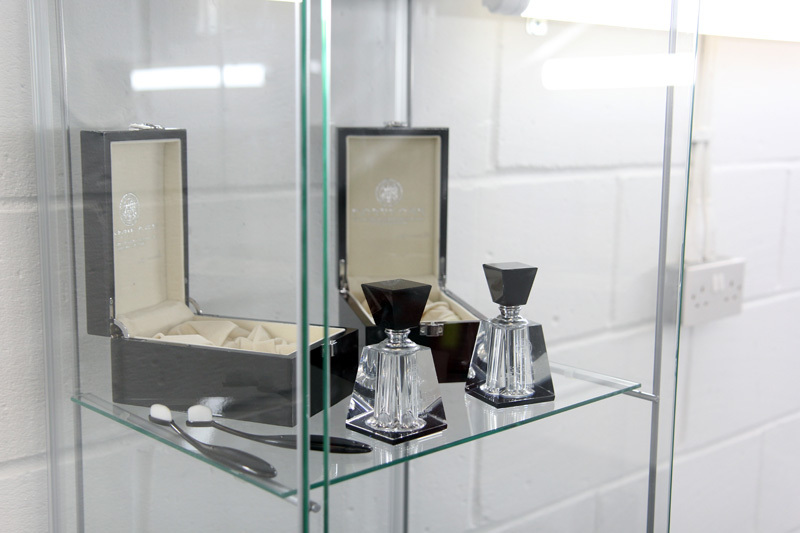 Employing the ‘kaizen’ approach, Kamikaze Collection focuses on continuous improvement to ensure their customers benefit from products that really do add value. The Japanese car care industry has pioneered the growth of the glass coating industry, historically based around inorganic chemistry. Durability and hardness of the coatings have been the main focuses and key selling points of these coatings, but for Kamikaze Collection CEO, Kai Morita, many of these claims were overstated or unrealistic. As users of these coatings have begun to discover, many of them simply aren’t performing in line with their marketing promises. As such, users have started to become wary of the hype. 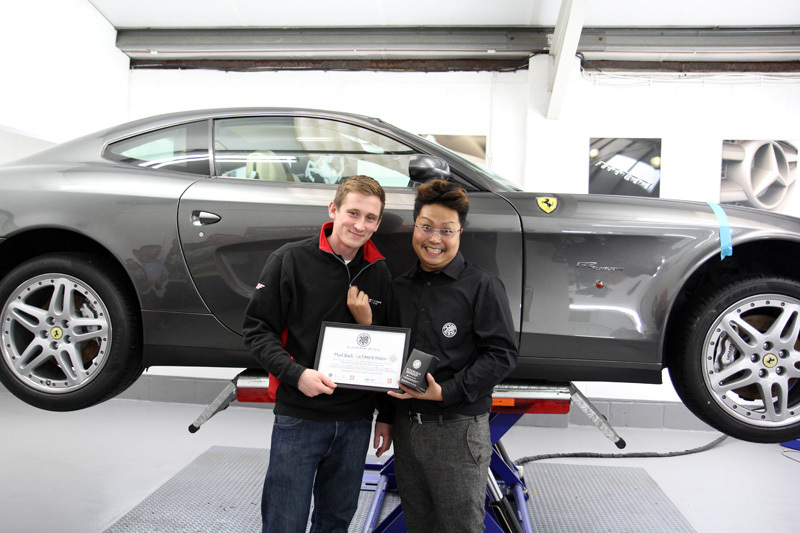 Kai created Kamikaze Collection in 2013 to bring high performing products to the car care market, products whose performance would speak for themselves without employing marketing tactics. Instead, through hard work and persistence, Kai has been growing the reputation of Kamikaze Collection by striking up key relationships with partners and respected detailers around the world. How Is The Kamikaze Collection Ethos Different? A coating should be a sacrificial layer – it’s meant to take the onslaught that clearcoats would otherwise be subject to. As a sacrificial layer, it may be replaced at intervals to ensure the continued protection of the clearcoat. Clearcoats are subjected to a myriad of potentially damaging elements. Coatings based singly around organic or inorganic chemistry cannot offer protection from all of them. Better protection is derived from combining the uniquely protective elements of both. 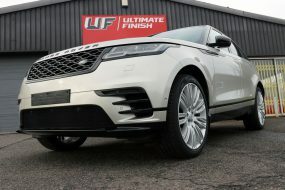 Multiple layers of a single coating are redundant – one layer or a combination of two products with different properties should be sufficient to provide protection from the elements and to deliver a show-winning shine. 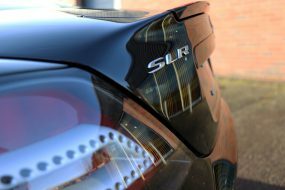 Anti-Ageing Theory – paintwork and its protective coating are like skin, they require specific products to ensure their appearance and performance remain at their best. Using inappropriate products will cause the coating to age more quickly, so the right maintenance products are essential. In line with their theories, Kamikaze Collection has produced Miyabi Coat, ISM Hydrocarbon Coating and Infinity Wax Hybrid, all available to professional detailers and car care enthusiasts alike. Recently, though, Kamikaze Collection has released, ENREI Coat, a two-step sealant that combines organic and inorganic elements to provide superior protection from chemical and environmental contamination whilst delivering a candy-gloss shine. 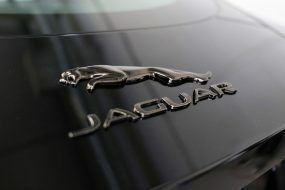 It is the first of their products to be reserved for professional detailers only. 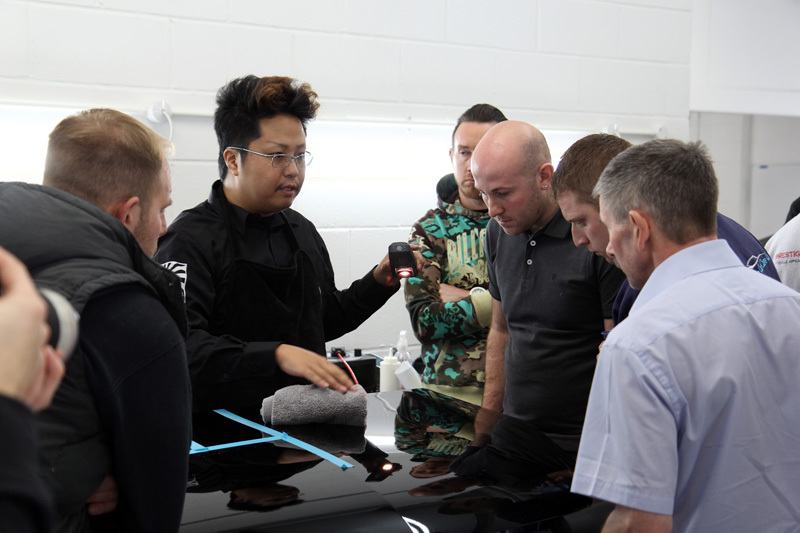 As such, in order to preserve the reputation of their first pro-only coating, only those professional detailers who have attended a training day are able to offer ENREI Coat as a service to their customers. 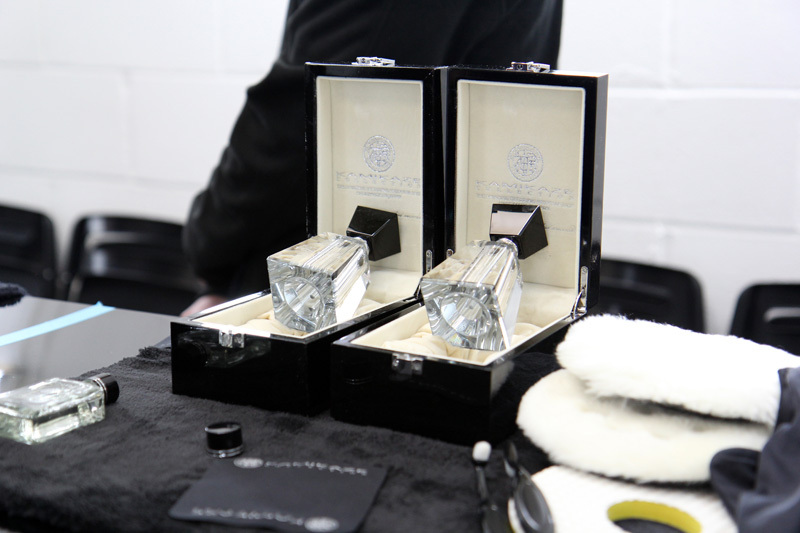 To ensure Kamikaze Collection International was represented in Britain for product enquiries, sales and training, Kamikaze Collection UK was set up. 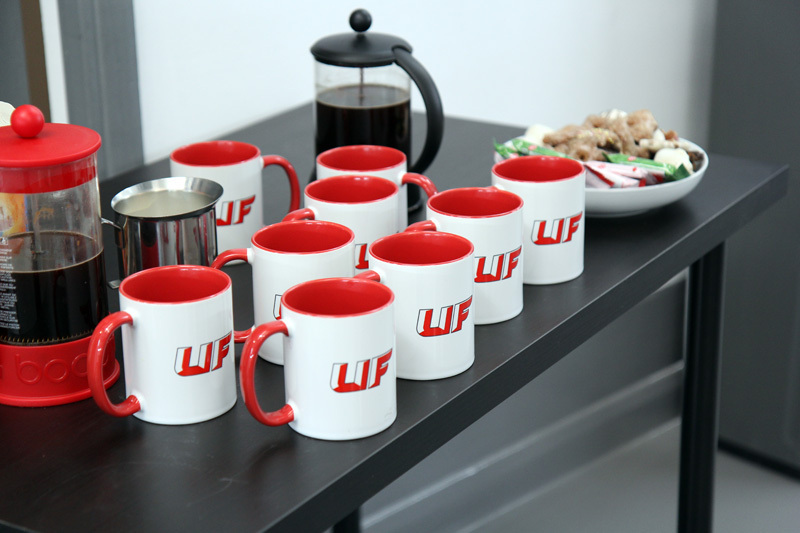 The first training day was arranged for December 2016 with UF hosting the event at their headquarters in Brands Hatch, Kent. As well as demonstrating the Orange Peel Removal Pad, Kai also discussed Ichiban Finishing Compound, a jeweling polish developed with the traditionally softer paint finishes typically found on Japanese marques in mind. 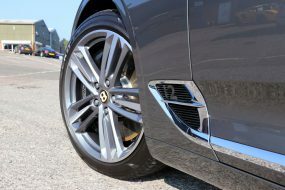 Stance Rim Coat, the new protective coating for alloy wheels was also on show. Unlike many other wheel coatings which typically are also suitable for application to other lacquered surfaces, Stance has been specifically designed to protect wheels. As the closest moving part of the car to the ground, wheels are subjected to a particularly hard time. As well as collecting a lot of dirt, grit and grime they also have to endure being drenched in liquids containing abrasive particles and harsh chemicals. This could be it rainwater contaminated with diesel or sand and road salts used for keeping the roads clear in icy conditions. As such they require a particularly tough coating that can repel all of these types of contamination successfully. Stance Rim Coat does not have to be applied thickly: 30ml of Stance Rim Coat is sufficient to coat six sets of wheels. Attention then moved to an additional, professional-only coating soon to be released: ISM PRO Hydrocarbon Coating. 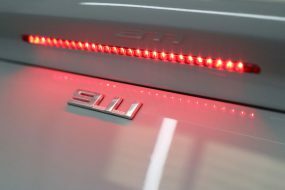 Although is carries the same designation as the enthusiast product (ISM Hydrocarbon Coating), the pro version has been newly developed incorporating cutting edge German technology with the ultra-low molecular weight hydrocarbon technology developed in Japan. The result is a coating that repels water almost as well as ENREI whilst delivering an even glossier shine than the original ISM Coat. For all the detailers who attended, the key message from Kai was on the application process for all the coatings. 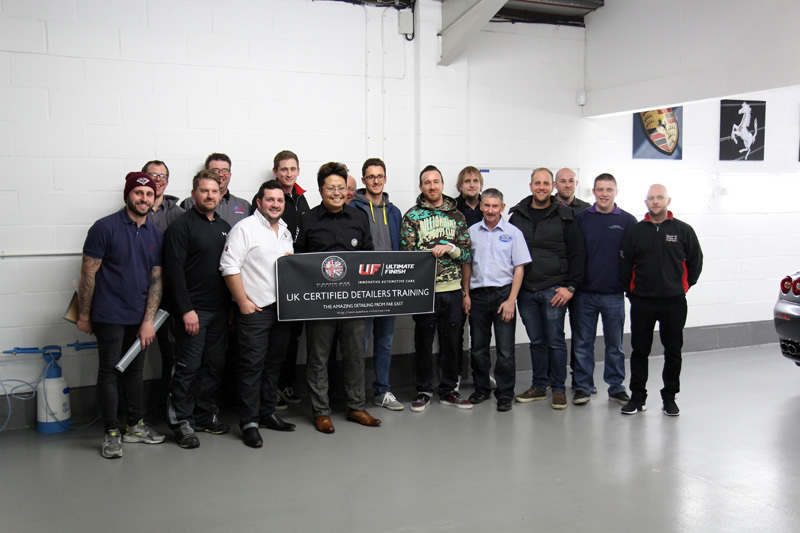 At the end of the training day, all the detailers were presented with their Kamikaze Collection authorisation certificates. More images from the training day can be viewed on the Kamikaze Collection UK Facebook page. A further Kamikaze Collection UK Training Day will be hosted at UF on Friday, January 27th, 2017. To register your interest please complete the questionnaire here. Kamikaze Collection ENREI Coat is now available as a service at UF Detailing Studio – Award Winning Detailing. Call 0333 800 8004 to discuss your requirements.